We take a closer look at the versatile pooch pouch carrier from dog product specialists Outward Hound. If you have a small dog like a Chihuahua or Shih Tzu, you don’t always want to put them in a traditional box carrier. Pouches fit over the shoulder and are designed to envelop your dog while keeping them secure. Front pouch carriers have become increasingly popular over the last few years. For many owners, they allow easy access to their dog while remaining hands-free. If you live in a busy town or city and take your dog everywhere with you, this is an indispensable product. Pouch carriers are also popular with hikers. Small dogs can’t always cover the large distances that big breeds love so much. Wearing a pouch means you can pick up your miniature and carry them when you need to. In this review, we’ll look at the features of this carrier, colors, sizing information, the advantages and disadvantages, feedback, and pricing information. If you’ve come here with the intention of buying it or reading up-to-date customer reviews, click on the link below. CLICK HERE to Find Pricing Info & Read Customer Reviews on Amazon! 1.1 Who Are Outward Hound? Comfort and security are normally the prime objectives for any pet carrier. This product from Outward Hound has padded straps and fits easily over the shoulders. It’s suitable for a wide range of small dogs include miniature breeds and puppies. Like most pets, dogs like to see where they are going. The good thing about the Pooch Pouch is that your small dog fits neatly into the bag/pouch area with their head facing front. They are close enough to you that they won’t panic and once used to the carrier should remain perfectly calm. This pouch carrier also includes a large, front zipper pocket so you can store leads and toys as well as a few treats. If you’re out for a hike in the country, this is the perfect way to ensure you’re not always waiting for your pooch to catch up. This US-based company is always looking to innovate and create new products. They often combine great usability with endearing stylishness. Their reputation has grown over the years, and they are now a favorite brand for many pet owners. The PoochPouch Front Carrier comes in two sizes, small and medium. The small is 6.5 x 10 x 8 inches and is suitable for toy and small dogs, under 10lbs. The medium measures 8 x 11 x 10 and is for slightly bigger breeds, under 20lbs. The makers suggest measuring your dog when seated to find the perfect size. The front carrier comes in two different color designs: blue and gray. This Pooch Pouch is only meant for puppies and mini or toy breeds. If you have a bigger pet, take a look at the Alfie Pet by Petoga Couture reversible pet sling review. Pouches for dogs can vary in the way that they hold your animal. Some provide cushioned protection, others a simple bag that can be drawn up around the animal’s neck. The Outward Hound Front Carrier falls into this second category. What owners tend to look for with a pooch carrier is that it fits comfortably. It also needs to be something that a small dog will take to quite easily. Getting your chihuahua or Shih Tzu accustomed to being carried in this way can, as many owners will testify, take a little effort and patience. 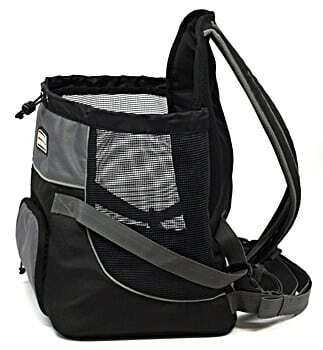 CLICK HERE to Buy the Outward Hound PoochPouch Front Carrier on Amazon! Padding is all-important with these carriers, so the PoochPouch has it at the base and back. The shoulder straps are also padded and help distribute the weight evenly for a comfortable carry. The pouch is made of a waterproof material which makes it ideal for hiking. To keep your dog cool, there’s a mesh vent on both sides of the pouch. You get a reasonably large zipper pocket for storing things like leads or toys (or even your smartphone!). Safety is provided by a secure harness clip which means your dog won’t be jumping out unexpectantly. The drawstring also allows you to comfortably close the opening around your dog’s neck and shoulders. 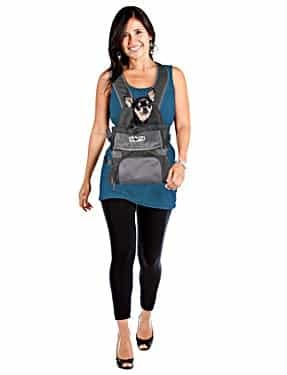 Compared to other pouches, it’s a lot easier to lift your dog up and place them in this open-necked carrier. The key is making sure you measure your dog properly and choose the right size. The fact that there are only two colors may put off owners who like a little design choice. Size of dog matters when it comes to front carriers like this. If there’s too much space, your pooch can feel like they are jiggling around. Too little and it can seem a little more than cramped. If you have a pooch that’s small enough to carry but doesn’t quite fit the requirements of the pouch, you might like to try a roomier backpack instead. Small and miniature breed dog owners love pouch front carriers like this. They often don’t like to leave their pets at home and prefer to carry them with them wherever they go. For long hikes and walks in the country, you need some method of transportation for a small dog. Many owners (and their dogs) prefer to be front facing when carried. That’s why the pooch pouch works on many different levels. It helps keep the dog and the owner calm because they can see each other. It’s not just dog owners that love the PouchPouch Front Carrier, however. Some cat owners do, too. A lot will depend on the temperament of your cat as they are less easy to train to stay in an enclosed space. Finding the right carrier for your dog is important if you like to take them with you everywhere. Even on a short jaunt to the vets, though, you want something that is easy to use and which your dog is comfortable with. Customers point to the fact that it’s pretty easy to train a small dog to get used to the PoochPouch. It takes a little patience with some breeds, of course. The usual strategy is to wear it around the house and encourage your dog to cuddle up in it. Then gradually move on to walking around the house before finally heading outside. Some customers bought the PoochPouch because they wanted something secure for their pooch on a bike or motorcycle. 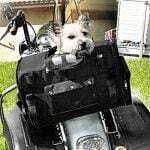 One customer regularly travels with their miniature dog on a Harley Davison. They advise fitting our dog with a harness rather than a collar if you are traveling this way as it is much safer. It’s also great for walking, according to many customers, and this is one of the main reasons that Outward Hound first developed the pouch. Hiking with a small dog can be a bit of a chore. Those tiny legs aren’t equipped for long distances. Picking up your dog and carrying them in a pouch is far easier than carrying them by hand. Comfort is another issue that customers are happy to point out. The padding in the pouch keeps both owner and dog comfortable. The shoulder straps are also reasonably well padded which is not always the case in front-loading dog carriers. Value for money is another positive with this carrier. It’s made of durable material and is waterproof and comes in at a fairly affordable cost compared to other pooch pouches on the market. You can expect it to last. Some customers have pointed out that a bit of extra storage space, particularly for a water bottle, wouldn’t go amiss. That’s something that Outward Hound could maybe think about in their next design review. While the leash clip is pretty sturdy, some customers did point out that maybe it could be a little longer or at least adjustable. Many dogs love the pouch because they aren’t ‘zipped in’ as with other carriers, something which most customers have seen as a positive design innovation. If you are the owner of a small dog or puppy, buying a pouch carrier is a good option for getting around. Smaller dogs generally don’t like to walk too much anyway. But if you live in a busy location such as a city, they can often also get lost and scared underfoot when at ground level. Whether you settle for a traditional carrier or not, adding a front carrier to your pet gear is a good choice. 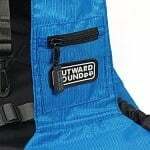 The Outward Bound PouchPouch Front Carrier works for many customers and seems to tick most of the boxes. While it’s in the affordable range, it’s also pretty stylish and simple to put on. Key is going to be whether your dog takes to this sort of carrier in the first place. In our experience, most miniature breeds are fairly easy to train to sit quietly in the pouch as long as you are patient enough. It’s also useful if you have a dog that is a little under the weather and you don’t want to leave them at home. The secure harness attachment means they are held safely in the pouch, and you don’t have to worry about them escaping. If you’re looking for a solid carrier for a small dog like Shih Tzu or Chihuahua, or even a puppy, this is a good one to check out. CLICK HERE to Buy this Front Pouch Carrier on Amazon!